Hey Everyone! It is SATURDAY and time for the Sweet Stop Sketch! I took the sketch and flipped it to the side and then added this Sweet Umbrella Peeker Girl . I kept the colors in a monochromatic tones. Have you checked out Susana's Mixed Media Line? She has SOOO MANY COOL ELEMENT Stamps AND DIES! On this card, I used the Rays and Steampunk Clock Set and added the Vintaj Clockwork Elements to further embellish the project. I used the Rays and Steampunk Clock Set and embossed the hands of the clock with Gold Embossing Powder and cut them out using my craft scissors. Hello Everyone - The past 2 months has been a whirlwind of activity in our home. I started as a Norwex Demonstrator in June and that took off like wild fire. I am SO blessed!! I will be adding some Norwex things to my blog as well as I go along and find some time too! Ink: Blushing Bride for skin tone. 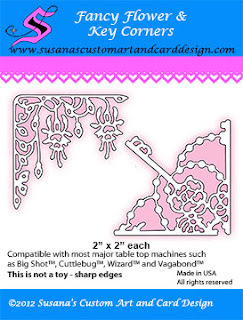 Susana has all kinds of NEW fabulous papers in her store! On todays card, I used the cheerful So Happy Together by Echo Park Paper. You can see all the beautiful patterned paper that Susana carries HERE. I also used the totally COOL new Petaloo Premier Cruelty Free Feathers (just scroll down)! You can choose from a wonderful variety of colors. There is a WIDE variety of Mixed Media things in Susana's store! Sure to fit every artists needs! To add a bit of flair to my project, I added the Jasmine Frame memory Box Die . I used the Sakura Quickie Glue Pen to adhere it to my project. To finish off this cutie pie card, I used the Ice White Viva Pearl Pen on the flowers and the corners. This is only a SAMPLE... there are 6 more! New Metallic Distress Stains, Distress Clear Rock Candy Stickles and Distress Clear Rock Candy Dry Glitter- HERE! I hope you enjoyed my project today! Thank you for stopping over! have a blessed day! They are available exclusively at SCACD and at Quixotic Paperie for our crafty friends overseas. 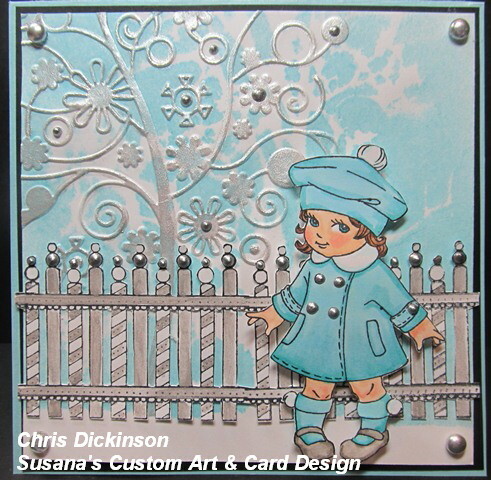 Hi Everyone - Have you joined in on the FUN this week for DRS DESIGNS Challenge? Yes... it is WHEELS but come on and join us! It isn't too late! If you do not have a "WHEEL" make your own! On my "float" I used a Soccer ball stamp to create my wheel. :) You can see the challenge HERE. On my card today, I used the FOUR CORNER SPORTS image to create the wheel on my parade float. The Band Member image is called MARCHING BAND TRUMPET and the sentiment that goes PERFECTLY with these fun images is the BEAT THE BAND GREETING. The foliage on the float is the FOUR CORNER BUTTERFLY BACKGROUND. I sponged the background with Bashful Blue Ink and used Silver Chrome Viva Pearl Pen. Hello Everyone! 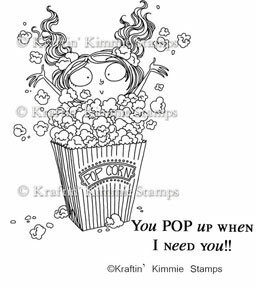 Welcome to my blog today for SWEET STOP SKETCH SATURDAY! Are you ready for a NEW sketch this week? It is Sweet Stop Sketch Saturday!!! I had a blast paper piecing and coloring this sweet image from Susana's Custom Art and Card Design and the Story book Collection! Such ADORABLE images, that make it fun to reminisce those special moments with your own children! Those moments FLY by, so I thought the Idea-Ology Chit Chat Stickers was the perfect way to "Treasure the Moment." I stamped the "Motherly" image in the back using the Blank Canvas Collection . to finish off the card. SCACD: NEW RELEASE -CUTE AND CUDDLY! HELLO EVERYONE! Welcome!!! Today get ready for a Cute and Cuddly release from Elisabeth Bell for SCACD!!! I am SO excited to share these ADORABLE images!!! You should have come from Lori's blog and you hop on to Kim's Blog and if there are any hiccups - go to the Follow Your Heart Blog to find your way to the NEXT location. Our first set, The Storybook Collection, brings us all back to those childhood days when our best friend was our beloved Teddy Bear. We all told our secrets to our Teddy Bears, had a few misunderstandings but we always made up and were ready for new adventures to unfold. Next we have a set of 4 adorable little girls with their FUN hats that make up Sampler #6. Each little girl is bound to make you smile and melt your heart. Our final set, Sampler #7, is a variety of cute and fun! These 4 little girls remind us all of the simple pleasures of childhood from lollipop dreams to playing in the rain. Now for my second project - She is SOOOOO sweet and All Bundled Up! 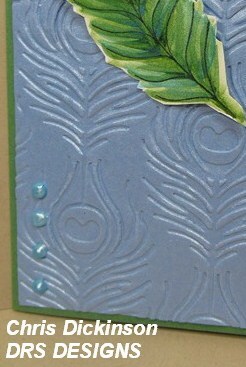 I created the background by using the Crafters Worker -Treescape Stencil and Light Blue Glimmer Mists. I then ran the cardstock through my Big Shot with the Far Away Tree Embossing Folder. Here are some more details: Stamps: All Bundled Up! 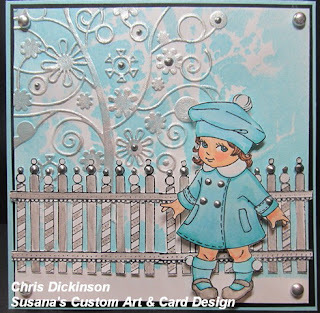 and the fence is from M's Place - painted with the Creative Inspirations Paint, Antique Silver and the Water Color Brush. 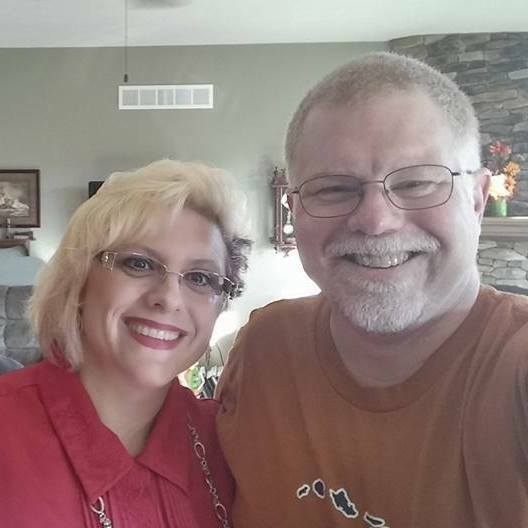 Don't forget to go to Kim's Blog NEXT!!! You will NOT want to miss what she has in store for you! I hope you enjoyed my project!!! Happy Hopping and have a WONDERFUL day!!! Here is the SWEET STOP SATURDAY SKETCH!! I used the Brown Viva Pearl Pen that is available at Susana's Custom Art & Card Design along with TONS of other FABULOUS PRODUCTS! Check it out!! !